CVS Photo, online at cvsphoto.com, is the destination for quality prints and photo gifts. At CVS Photo, it's easy to upload your favorite pictures and create prints in different sizes, canvases, posters, passport photos, collage prints, photo books, holiday cards, stationary, wall decor, printed mugs, awesome customized gifts, and more. CVS Photo makes it fun and easy to preserve your favorite memories for years to come. But before you shop, get all the latest cvsphoto.com discounts, CVS Photo promotions, and CVS Photo coupon codes found here at RetailSteal.com. 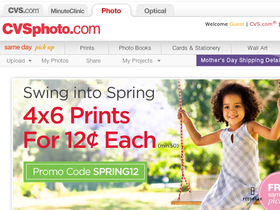 CVS Photo ships to home and offers free same day pick-up from CVS Pharmacy locations. See site for more information. Shop at CVS Photo and enjoy 40% savings on posters. Click here for code. Shop at CVS Photo and enjoy 45% savings on Custom Cover Photo Book orders. Click here for code. Shop at CVS Photo and enjoy 25% savings and free shipping on orders of $49 or more. Click here for code. Shop at CVS Photo and enjoy 20% savings on cards. Click here for code. Shop at CVS Photo and get 50 4x6 prints for just $0.19 each. Click here for code. Save up to 25% on the latest deals from CVS Photo. Upload your favorite pics today to create lasting memories. Shop CVS Photo for prints and more and enjoy free same day pick up from your local CVS. Click here to shop and save today. Shop the selection of personal gifts under $20 from CVS Photo. Shop now and enjoy. Shop CVS Photo and customize your own photo mug for as low as $11.99 - click link to shop.